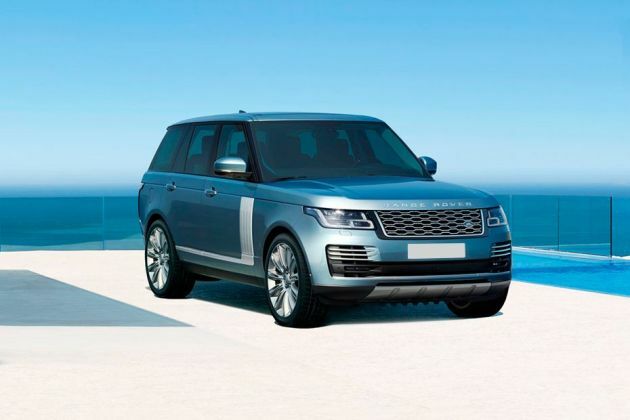 JLR, one of the popular luxury car maker in India has officially rolled out the long wheelbase version of its iconic SUV Range Rover in the country. The company introduced the LWB version of this model in about four trim levels among which, the Land Rover Range Rover LWB 3.0 Vogue is the entry level trim. Powering this trim is the 3.0-litre TDV6 diesel motor that can produce a maximum power of 244.6bhp in combination with a peak torque of 600Nm, which is quite good in its class. The manufacturer has not made any changes to the specifications or features of this vehicle as the update was an increase in its wheelbase. The car maker has increased its wheelbase to about 198mm, which makes the interiors more spacious. Besides this, its overall length is also improved to about 200mm to 5199mm, which is a major update given to the vehicle. On the other hand, it comes with same set of features and equipments like those in the existing variants. This luxury SUV comes equipped with sophisticated features like adaptive dynamics, terrain response system, cruise control system and active speed limiter, which enhances the driving comforts. The exterior appearance of the Land Rover Range Rover LWB 3.0 Vogue looks quite identical to the existing variants, but it comes with increased length and wheelbase. This SUV has a total length of 5199mm and an overall wheelbase of 3120mm. Its overall width is 2220mm (including the ORVMs) and the total height is calculated at 1840mm, which remains identical to the existing variants. On the other hand, it comes with minor tweaks to its front facade as it gets adaptive xenon headlamps with signature LED lights . It flanks a neat radiator grille, which is further fitted with the iconic company's badge. Its front bumper gets a minor update in the form of a sleek air dam and redesigned air duct console. The fog lamps have been placed below the air ducts that provides good visibility ahead under foggy conditions. The side profile looks slightly longer than the existing version, while its design remains identical. Its wheel arches have been fitted with a set of 19-inch, 5-split spoke alloy wheels that gives an urbane look to the side profile. Coming to the rear, its has a flat windscreen that is accompanied with a rear spoiler along with high mount third brake light. The tailgate has a classy design and it is fitted with a wide yet thick appliqué along with Range Rover lettering in chrome. The rear bumper looks trendy and has a dual tone look, which adds to the classy appeal of rear. The interior cabin of this 2014 version gets ample leg space, thanks to the long wheelbase of 3120mm. The company has retained the design of its interiors along with the features as well. This entry level trim is blessed with Oxford leather seats that features 12 way adjustable driver and front passenger seats with memory function . The rear seats have four way lumbar support, which further enhances the passenger comfort. The cockpit section looks very attractive, wherein the dashboard has a magnificent design and it is further accentuated by a lot of chrome inserts. The central console gets a wood finish and is further equipped with advanced equipments. This variant is powered by a sophisticated 3.0-litre, TDV6 diesel power plant that is incorporated with a direct fuel injection system. It comes with 6-cylinders, 24-valves that displaces 2993cc and it is further incorporated with a turbo charging unit. This enables the engine to unleash a peak power output of 244.6bhp at 4000rpm, while generating a peak torque output of 600Nm at 2000rpm. The company has skilfully coupled this power plant with an 8-speed automatic transmission gearbox that transmits the torque output to all the four wheels in the form of an all-wheel drive layout. This engine helps the vehicle to reach a top speed of approximately 209 Kmph, while reaching a 100 Kmph mark from a standstill in just 7.9 seconds. On the other hand, it can deliver an impressive mileage in the range of 11.76 Kmpl to 14.28 Kmpl. The company has coupled all the four wheels of this LWB version with a set of high performance disc brakes that are further accompanied with superior brake calipers. This disc braking mechanism gets the assistance from the anti lock braking system along with electronic brake force distribution that keeps the vehicle stable on slippery roads. Furthermore, it is incorporated electronic stability program, which regulates the braking system of all four wheels and further augments it, especially on terrains. This SUV is blessed with advanced aspects like adaptive dynamics, terrain response system and cruise control system, which makes the handling simpler on all forms of roads. The manufacturer is offering this Land Rover Range Rover LWB 3.0 Vogue trim with sophisticated equipments that provides enhanced comforts to the occupants. It comes with a four zone automatic climate control unit including the rear AC vents, that keeps the entire cabin cool. It also has heated leather steering wheel with multi-functional switches, which adds to the convenience of driver. The company is also offering a list of features including front central console cooler compartment, illuminated aluminum tread plates with Range Rover lettering, carpet mats, customer configurable interior mood lighting, auto-dimming interior mirror and many other advanced aspects. The car maker is also offering an advanced Meridian audio system along with rear seat entertainment system that features two individual 8-inch touch screen with remote control. Furthermore, it gets a TV tuner and Bluetooth connectivity for phone and audio streaming. Coming to the safety aspects, this entry level trim is incorporated with sophisticated features like key less entry, volumetric and perimetric alarm with engine immobilization, airbags, hill descent control, dynamic response, roll stability and dynamic stability control. Furthermore, it is also incorporated with an electronic brake force distribution, electronic stability program, emergency brake assist and electronic traction control program. 1. Lavish interiors with sophisticated comfort features. 2. Performance of the engine is remarkable. 1. Exterior appearance can be made better. 2. High cost of ownership adds to its disadvantage. ల్యాండ్ రోవర్ రేంజ్ రోవర్ 6 వేర్వేరు రంగులలో అందుబాటులో ఉంది - Corris Grey, Loire Blue, Scotia Grey, Santorini Black, Fuji White, Indus Silver. Very nice car It very comfortable car. It 's very powerful it uses off-road. It is a very beautiful car. The Range Rover is the dream car of everyone. With fantastic design and muscular body, this car is beyond comparison. This car is my dream car. I wish to buy this car.